As we approach Mickey Mouse's 90th anniversary, I have started preparing some special columns devoted to the world famous character. One person who has worked extensively with Mickey over the years in a number of different formats is Floyd Norman. By now, everyone should know who Floyd Norman is. He is not just a Disney Legend, but a true Disney treasure. I have known him since the 1980s, and while I have gotten a lot older and grumpier, he has remained preternaturally young at heart with a mind as sharp as ever and an undiminished artistic talent. Norman is an animator who worked on the Walt Disney animated features Sleeping Beauty and The Sword in the Stone, as well as a storyman on The Jungle Book. After Walt Disney's death in 1966, Norman left the Disney Studio to run his own short-lived animation studio, as well as work at a variety of different animation studios, including Hanna-Barbera. The "Mickey Gang" at the Walt Disney Studios helped bring the character to life in this picture from People Magazine. He returned to Disney in the early 1970s to work on the Disney animated feature Robin Hood and several projects for Disney Publishing, including the Mickey Mouse comic strip. He contributed creatively as a story artist on films such as Toy Story 2, Monsters, Inc., Mulan, Dinosaur, and The Hunchback of Notre Dame among others. He continues to work for the Walt Disney Company as a freelance consultant on various projects. He was inducted as a Disney Legend in 2007. Floyd's book chronicling his career is titled Animated Life: A lifetime of tips, tricks, techniques and stories from an Animation Legend (Focal Press 2012) and he was the subject of the documentary Floyd Norman: An Animated Life. Floyd was gracious, once again in August, to take some time to answer some of my questions. The only thing missing is seeing his engaging smile and hearing his wonderful laugh as he shares these stories. Jim Korkis: You've certainly had a long association with Mickey Mouse. What was your first memory of Mickey? Floyd Norman: My first memories of Mickey Mouse came from the Dell comic book, Walt Disney's Comics and Stories. When I was very young, my grandmother would sometimes read the stories to me. In time, I began to purchase my own comic books. They were only a dime but each one was a treasure. In time, I began to collect the Disney comic books and I kept my collection in an old suitcase which was eventually thrown away by my mother. Oh, the horror! JK: Was Mickey a favorite character for you? FN: Those familiar with my career know that a good part of it has involved this little guy. He's a guy I grew up with and I enjoyed his antics in the Disney cartoons as a kid. I also accompanied him on a number of exciting adventures as I read the Disney comic books while sitting in the back seat of my dad's car. I do not exaggerate when I say Walt's famous mouse was a big part of my life. I loved all the Disney comic book characters. Mickey was always a favorite, of course, but I loved them all. Regarding age, I think Mickey grew along with me and I seemed to view the Mouse differently as I grew older. However, Mickey is a mouse for all ages. Concerning Mickey's resemblance to Bucky Bug, another one of my favorite characters, his appeal was obvious with the round face and the cartoony design. I always wondered why Pixar went with such an ugly design esthetic when they made, A Bug's Life. The film was well made, but its character design was totally lacking in what we used to call at the Disney Studios "appeal". JK: When I was working as an animation instructor at the Disney Institute in 1996, I remember you came out to see how we were teaching all the guests how to draw Mickey Mouse. FN: Yes, I do remember doing that. I was working with Disney's fledgling computer game department. If I recall, we were developing some sort of a drawing or animation program. We completed the project, but I don't know how successful it was. It did finally get to market, however. Mickey Mouse was a big part of the program. I've done so many things with Mickey it is sometimes hard to keep track. JK: You did a Quick Draw segment now posted on YouTube where you recreated the first Mickey Mouse comic strip. FN: The young kids from Maker Studios (which Disney acquired) came up with the idea. We had the original strips so the art was available. I simply copied the very first Mickey Mouse newspaper comic strip. I didn't practice. I simply faked it. After all, who would know? I sat at Floyd Gottfredson's desk while I was doing it. Plus, I took questions from the viewing audience while doing the strip. So you see, I can draw and speak at the same time. A Mickey Mouse comic strip created by Floyd Norman. His work has gotten a new life on YouTube as instructional videos on how to draw Mickey. JK: Animator Mark Henn once said, "Mickey Mouse is easy to draw…badly." FN: Mickey Mouse is a very simple character and that's what makes him so difficult to draw. Ollie Johnston did all the Mickey material for the daily TV show, The Mickey Mouse Club. To get Mickey right, Walt needed one of his finest animators to handle the assignment. Freddy Moore would have been perfect, but Fred had passed on, so the assignment went to Ollie. JK: You seem to do a lot of drawings of Mickey when you are at events or on television. FN: I draw Mickey for friends and guests simply because I can draw him quickly. It's all about speed when you're appearing on stage or television. I draw the Mouse because I know I can draw him in a few seconds. Plus, everybody immediately recognizes the famous mouse. JK: One of the most memorable Mickey artists is another Floyd, Floyd Gottfredson who drew the Mickey Mouse comic strip for decades. FN: I met Floyd Gottfredson in the 1950s when I began my animation career at the Disney Studios. Actually, we met the entire comic strip team. They were all very gracious and welcomed us young kids who joined the studio. However, we rarely visited the artists because we didn't want to become a distraction. I never knew Mr. Gottfredson that well. However, I did get to know his son, Norman, a good deal better. Isn't that odd? Floyd's son is named Norman Gottfredson. So there is "Floyd" and "Norman". Yes, it does sound spooky, doesn't it? Of course, I often sketched on Floyd's drawing table and it was just that. A drawing table. There was no magic or weird vibes. It was simply a drawing table. JK: Another memorable Mickey artist was Freddy Moore who you just mentioned. FN: I absolutely loved the sketches and animation of Freddy Moore and he contributed a great deal to the development of the famous Disney mouse. 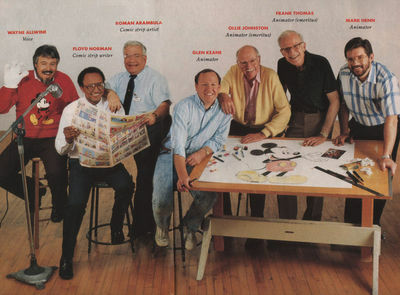 Ward Kimball and Fred Moore were good friends and embodied everything that was awesome about Disney animation, in my opinion. I truly loved them both. I assisted Ward in the 1960s, but sadly, I never met Fred Moore. JK: Did you ever meet Jimmy MacDonald who did Mickey's voice after Walt? FN: Yes, I met Jimmy MacDonald but I never requested he do the famous voice. I knew he had probably grown tired of that request over the years and I didn't want to bother him. When Wayne Allwine took over he did Mickey often and didn't seem to mind doing it. I can almost do the voice on occasion. But, it's not very good. JK: Do you have a favorite animated Mickey cartoon? FN: We've had many great Mickey Mouse cartoons over the years and I find it difficult to choose one. The iconic Mickey in Fantasia is the first comes to my mind. The animation is spot on. JK: I remember seeing you surrounded by other folks connected with Mickey Mouse in that Mickey is Sixty magazine published in 1988. FN: Yes, that photograph was originally commissioned for People Magazine, and of course it took three hours to shoot because that's what professional photographers do. You gotta justify the big paycheck. I was in makeup for 20 minutes. It was the "Men Behind the Mouse" thing with Wayne Allwine, Roman Arambula, Glen Keane, Ollie Johnston, Frank Thomas and Mark Henn. We didn't talk about Mickey, however. Mainly, we talked shop. Things such as, how the studio had changed since the passing of Walt, and what might the future hold for the Disney Company. Frank and Ollie were a treasure, and we were privileged to spend this time with them. Charles Solomon got some quick quotes from all of us about Mickey that was used with the photo. JK: How did you end up writing the Mickey Mouse newspaper comic strip? FN: File this under "Jobs I Didn't Want But Managed to Get Anyway." Cal Howard thought I would be a perfect fit for the comic department some years earlier. At the time, I was very much involved with animated filmmaking and didn't want a change. However, it was Greg Crosby who talked me into the job in November of 1983. It was also Mr. Crosby that stuck me with the Mickey Mouse Comic Strip. I did not want the job but Greg insisted I take it because he didn't have anyone else capable of doing the job. Or, so he said. Floyd Gottfredson had retired in 1975 and his successor, Del Connell who took over writing the strip was now finally packing it in and a new writer was needed. I didn't want the job. I often filled in for Del Connell when he was ill or on vacation. I suppose that made me the natural choice to helm Mickey when Del retired. I didn't mind writing Mickey on occasion but the thought of being stuck with the mouse for years was not something I found appealing. Since Mr. Connell worked from home, I never got to know him. JK: So you were already doing some writing for the comic strips. FN: The weekly writers meetings with old timers like Cal Howard, Del Connell and Bill Berg were often fun and sometimes turbulent. On one occasion, an angry writer lunged across the conference table and took a swing at another. This was not goofy fun, but true anger at the Walt Disney Studio. Disney artists and writers can be a pretty passionate group. Of course, this kind of crazy behavior would never be tolerated today. These guys had seen or already written every gag there was, so they never laughed at anything. You knew you had scored a hit when Cal would casually remark, 'that's funny.' The other writers included veteran gag men, Don Ferguson, Tom Yakutis, Don Dougherty, Lee Nordling, Willie Ito and Bob Foster. Our boss, Greg Crosby, had been a writer on the Disney strips himself before moving into management. I had the opportunity to work with an amazing group of talented individuals. And, honestly, you can't do much better than that. In spite of occasional clashes, we usually got along and had great respect for each other. It truly felt like we were experiencing the last days of Disney. In time, everything would change and Walt's creative enterprise would become increasingly more corporate and a lot less fun. JK: But you were being given an opportunity to write for Mickey Mouse. Not many people are given that chance. FN: Back in the 1930s, when Mickey Mouse entertained millions of adoring readers of America's newspapers, he was a spunky, feisty little guy who thumbed his nose at established conventions. He was an adventurer, and a fighter. Most of all he was entertaining and funny. By the 1980s, Walt Disney's famous mouse had morphed into a corporate icon and had all the vitality and energy of a middle-aged Ozzie Nelson who would hang around the house and react to things. I missed the good old days when Mickey was a bold, fearless adventurer and pursued an exciting life. These were the stories I wanted to tell. Writing gags always came easy to me and I was known for my cheeky sketches depicting the Walt Disney management and my fellow artists and colleagues that got passed around or posted. However, now I was required to crank out six daily gags along with a Sunday page and I had to do this every week. That wasn't the hard part. The assignment came with a terrible catch. I had to do all this using the character, Mickey Mouse when the famous rodent was hardly a barrel of laughs. It's tough to be funny when you've been given a character that has become a corporate icon practically devoid of humor, with the exception of a cute, "Hiya folks!" JK: And, of course, when you took over the strip, it was only in the gag-a-day format. FN: That's exactly what made writing Mickey Mouse so difficult. Disney and King Features Syndicate insisted on doing what they called, gag-a-day. I hated this concept because Mickey Mouse as a character does not lend himself to this kind of writing. I wanted to tell Mickey stories and send the Mouse on adventures. The syndicate resisted this for years. I found the job challenging and it was difficult to remain fresh and energized working within the King/Disney restrictions. I began to rely on Goofy to carry the humorous situations and Mickey became my straight man. This seemed to work for both Disney and King Features, so I plugged away until I could change things. I continually found myself in trouble with Disney's legal department because of the silly stuff I would write. Innocent gags—nay, stupid gags were now considered a corporate dig at other companies or organizations. I was often called upstairs to face our legal counsel and asked, why did I write a particular gag? My reply was plain and simple. "Because I thought it was funny." Let me give you an example. In one particular gag, Mickey's pal Goofy has purchased a satellite dish in order to get better television reception. As expected, Goofy—being Goofy—didn't quite understand the purpose of the tech device and simply used it as a bird bath. That's the gag. Soon, Disney received furious letters from Satellite companies. They were upset at the subtext in the comic strip and wondered why the big corporation was picking on them? Once again, I had to explain there was no subtext. We're not that clever or sophisticated, I pleaded. It was just a stupid gag. Keep in mind, Mickey's friend is named "Goofy." If we pushed Mickey too far it simply would not jibe with the corporate image of the Disney Company. If I pulled back, the gag simply wasn't funny. It was walking a tightrope where missteps happened often. Some strip ideas were rejected and even I have to admit that it was probably a good thing that some of them were. Here's one. Minnie Mouse is admiring new purses in a store window when suddenly her purse is stolen by a bad guy. Minnie is delighted because she can now enter the store and buy a new hand bag. Our boss, Greg didn't think the idea was very funny and didn't appreciate seeing a "robbery" in a Disney strip and felt it was somewhat inappropriate. JK: So how long did you have to keep this up? FN: After years of continual nagging, Disney and King Features allowed me to break out of the restricting, gag-a-day format and begin to write continuities. However, there was a caveat. The stories had to be short and needed be wrapped up in a three week period. On occasion, I managed to stretch that limit to four weeks. King Features Syndicate still ended up canceling the strip as it did so many others when readership for newspapers changed drastically. Perhaps it was time to let the newspaper Mickey finally ride off into the sunset. A decade later David Gerstein, on a research mission was digging through Disney files and comes across an original Mickey Mouse continuity from the early 1990s and he called the story to my attention. More than a decade had passed and I initially didn't recognize the sketches in front of me. Yet, the story line felt familiar. Had I read this, I wondered? "Should I know this story?" I asked. "Yes, you should," David replied "because you wrote it." JK: Again, as you said you've done so much with Mickey that it is hard to keep track of it all. Next week: Floyd Norman talks about a "lost" nine-week Mickey Mouse comic strip continuity; how Mickey Mouse brought Floyd a wife; how he tried to get Mickey, Donald, Goofy: The Three Musketeers released theatrically and more.